Exporter of a wide range of products which include hot air laboratory oven, laboratory vacuum oven, laboratory hot air oven and laboratory oven. 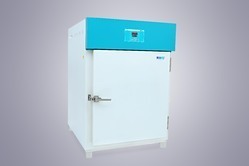 Finding suitability for use in research lab applications in different areas like in medical, agricultural, industrial researches, these advanced technology based Hot Air Laboratory Oven allow for optimum drying, heating, sterilization and baking support. This series of Laboratory Vacuum Oven consists of four different Sizes from 90 liters to 1000 liters. Coming with support of LED digital display that allows users to conveniently monitor chamber temperatures, these advanced technology based Laboratory Hot Air Oven options can be made available by us in both standard as well as customized working specifications.